Lots of results on Google but none have an authentic recipe that includes ammonium chloride . Re: Where can I find a recipe for Salmiakki? I can see your problem Cosmos! Have hit a brick wall too but I'm not going to give up - I will plough on regardless and sleuth my way to a Salmiakki recipe that contains Ammonium Chloride. 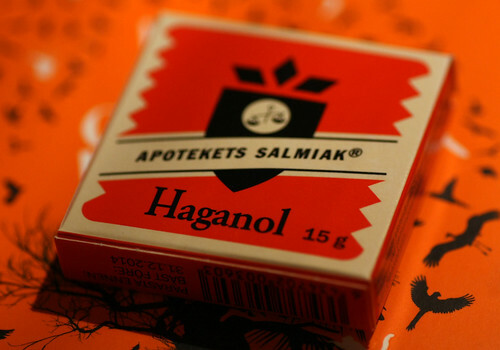 Just to let you know the background, I have eaten Salmiakki when I lived in Norway and also Norwegian Salty Liquorice which is pretty much the same - and I think Siasl is a fan of the stuff too. I almost acquired a taste for it - but not quite. So far I've trawled about 200 websites in Norwegian and Icelandic and drawn a blank. Next I will trawl Finnish websites (because Salmiakki is the Finnish name for Salty Liquorice) - but that I'm afraid will have to wait until tomorrow because it has just gone past midnight here right now so I am going to bed. But until then, I can at least tell you the correct ratios of Liquorice to Ammonium Chloride you could use in your recipe. If your recipe says use 1 tablespoon of liquorice powder then you should use 1-2 tablespoons of salmine salt (aka ammonium chloride aka salmiak). This comes courtesy of a young Norwegian lady blogger called Albertine in a small town in Norway called Vestvik (north of Trondheim). But as I said, I'm definitely going to bed now. I'll sleuth some more in the desolate wastes of Finnish cyberspace tomorrow. Fingers crossed I might hit gold. Nighty night. ... and I think Siasl is a fan of the stuff too. I almost acquired a taste for it - but not quite. The search goes on...Well Cos, I have worn my fingertips to a frazzle, tip tip tippity tapping through endless Finnish websites and I can only conclude that even Finns don't make their own Salmiakki - they are sensible and buy it store bought. This, as you probably already know, means 'Buy salmiakki with ammonium chloride'. You'll be rewarded with hundreds of hits - and each website has Google's handy little 'Translate this page' gizmo to click on before you open the site, so it will automatically translate into English for you if your Finnish is a bit rusty. Then it's just a matter of clicking relentlessly on until you find a website you like. You'll be able to buy truckloads of Salmiakki with Ammonium Chloride if you want and have it delivered straight to your doorstep - but why on earth you'd want to is beyond me...in my opinion the Ammonium Chloride gives the liquorice an inimitable taste of drain cleaner. But some people may like their liquorice with a strong hint of Draino. Happy munching!